The DR-M260 scanner can assist with efficient records management and help reduce paperwork in paper-intensive environments. 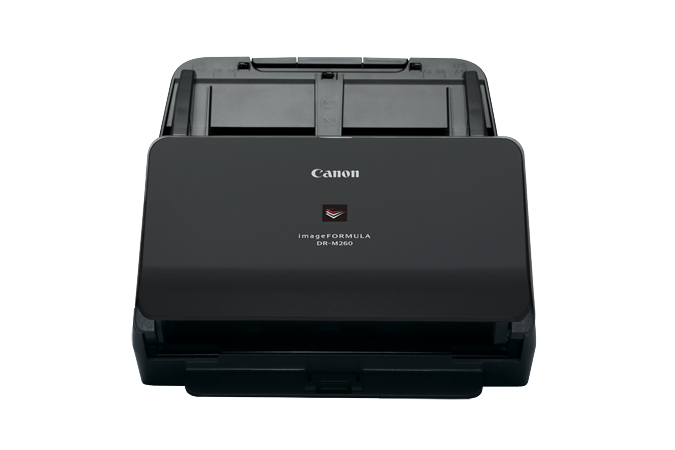 Capable of scanning up to 60 pages per minute*—both sides in a single pass— with the capacity to hold up to 80 sheets in the Automatic Document Feeder (ADF). Can reliably handle an assortment of document types, such as thick, thin, even oversized documents and plastic embossed cards. For an added benefit, optional carrier sheets allow passports with IC chips as well as fragile documents to be scanned through the ADF without corrupting the original documents. The DR-M260 scanner is bundled with a suite of convenient software to help widen the scope of capture and output capabilities. Canon CapturePerfect and Kofax Virtual ReScan (VRS) help to increase the overall quality of documents scanned. Uses Canon's imaging expertise to include Character Emphasis to help improve text legibility and Optical Character Recognition (OCR) to create searchable and editable information.